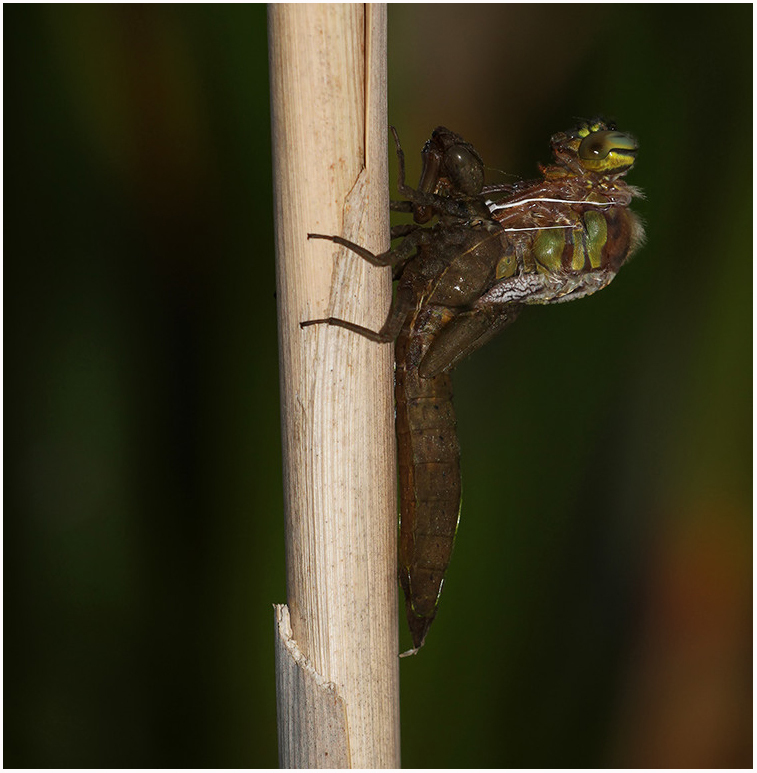 Kent Dragonflies: Hairy Night time Encounters! 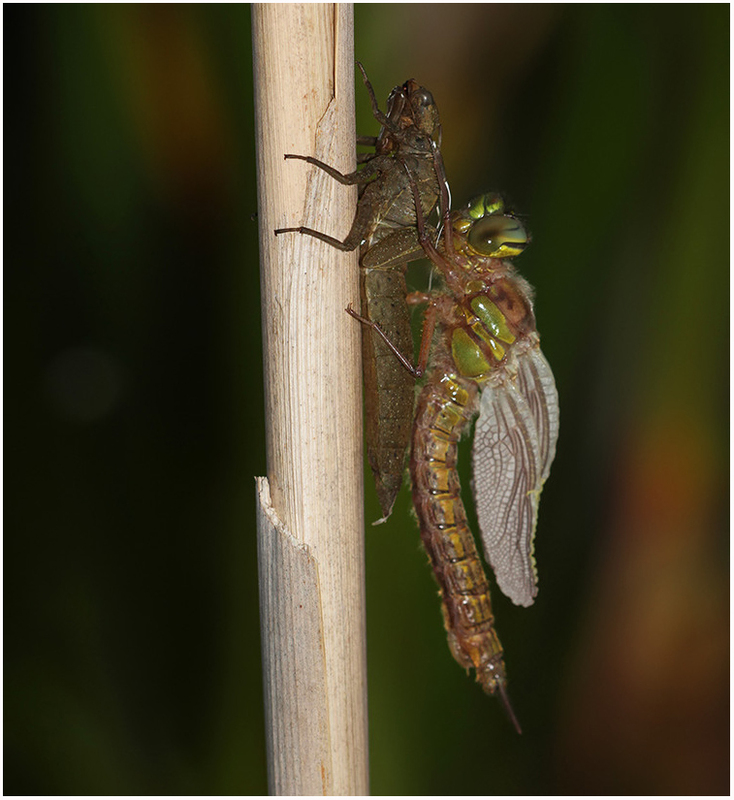 Over the past few nights, I have been out to my garden pond to see how the Large Red Damselfly nymphs are progressing but whilst out checking the other night, I found a Hairy Dragonfly nymph clinging to one of my pre planted stems with its head and back of the thorax sticking out of the water. Normally this is a sure sign that within a few days, they will normally emerge. 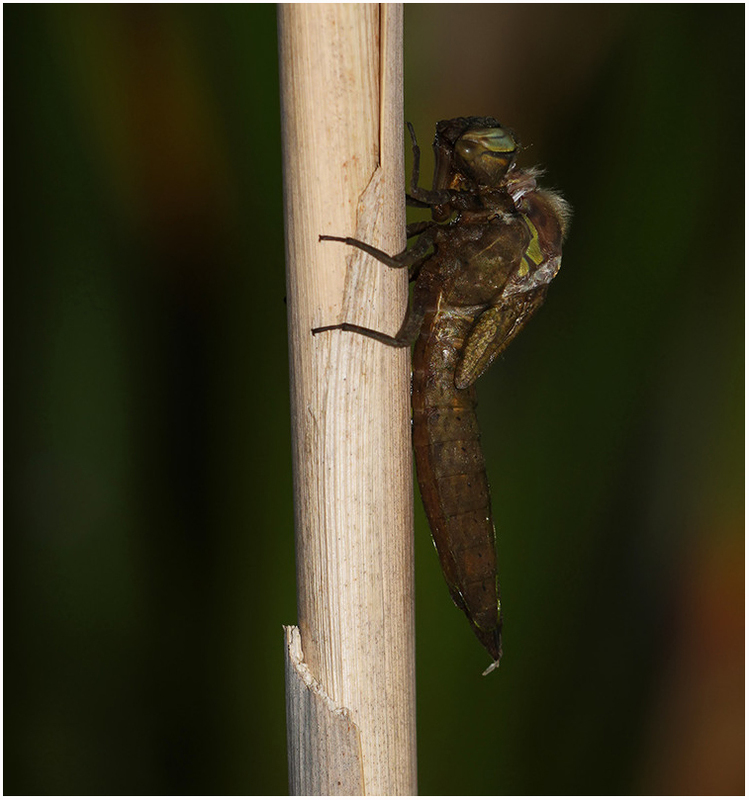 Seeing the first Hairy Dragonfly of the season is always a special moment that I look forward to every year. 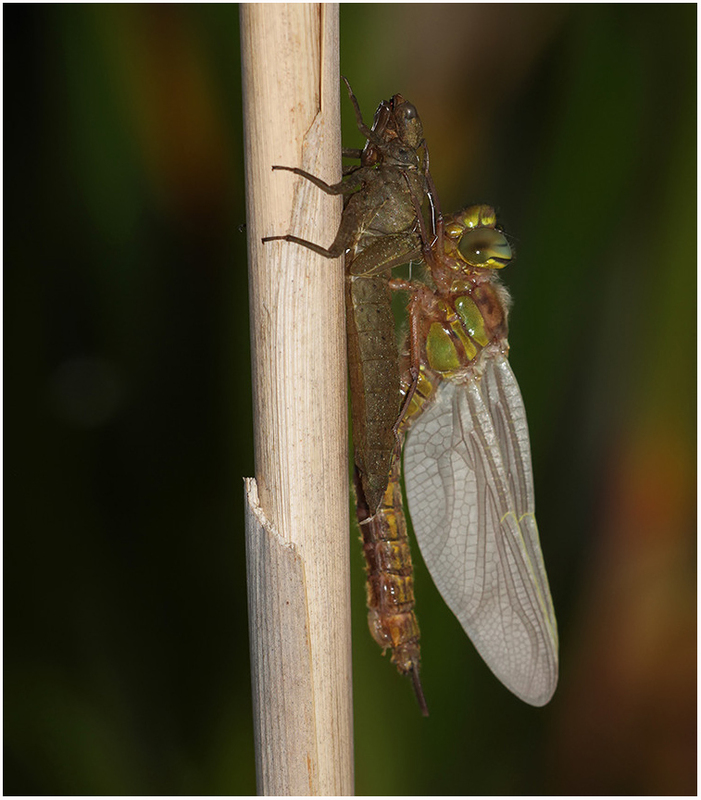 I checked for a few more nights where the nymph remained in position but when I went out last night around 21:15, the nymph had left the water and was in the process of climbing higher up the stem. 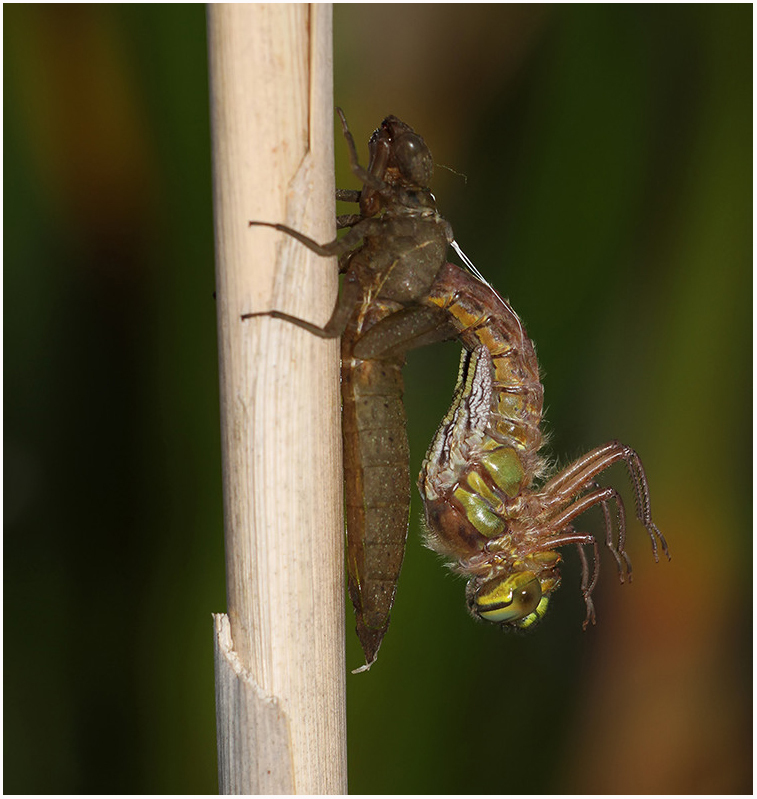 I stayed back at a distance where I could see what was going on and after seeing the nymph starting to thrash its abdomen around to make sure it had clearance to emerge, I went back indoors to get all the equipment required for a few hours photography. I pre warned the neighbours that they might be some flashing going on (the camera, not me!) and settled down at the pond and... waited. Once settled, the nymph took a while and remained motionless for some time before I could start to see the abdomen starting to move and the thorax area getting bigger. 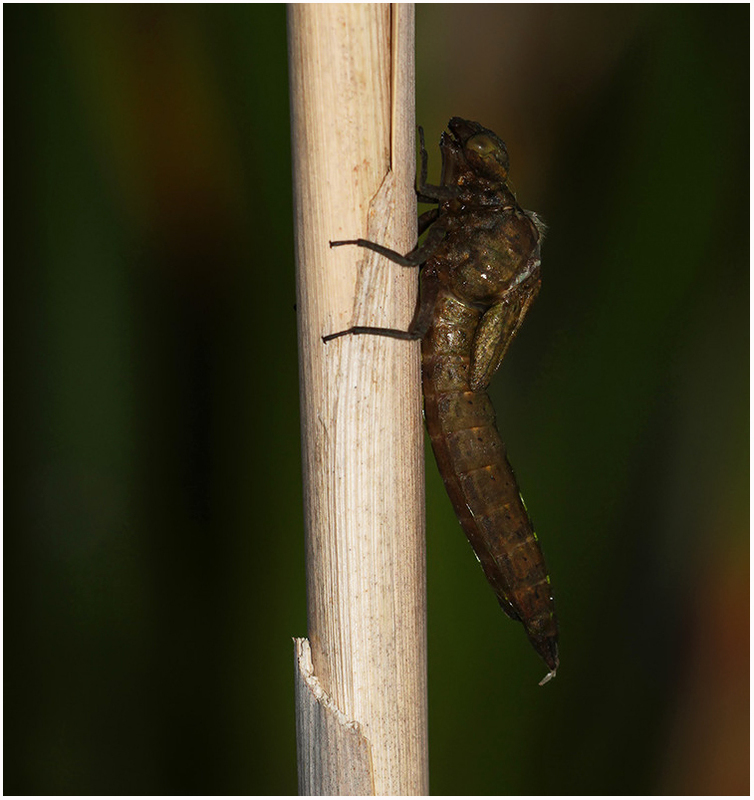 With the camera set up on a tripod low down and a flask with me to have a drink, I was then able to take a number of photos over the next two hours and watch as she entered the world as a female Hairy Dragonfly. 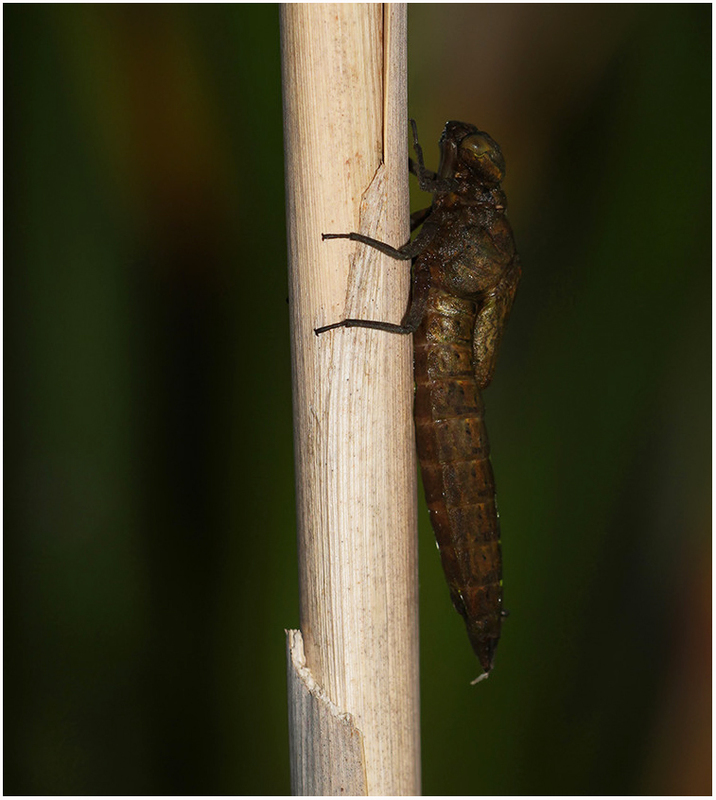 Thankfully, the emergence went well and around 23: 40, I decided to call it a night and retired indoors for some well earned sleep. 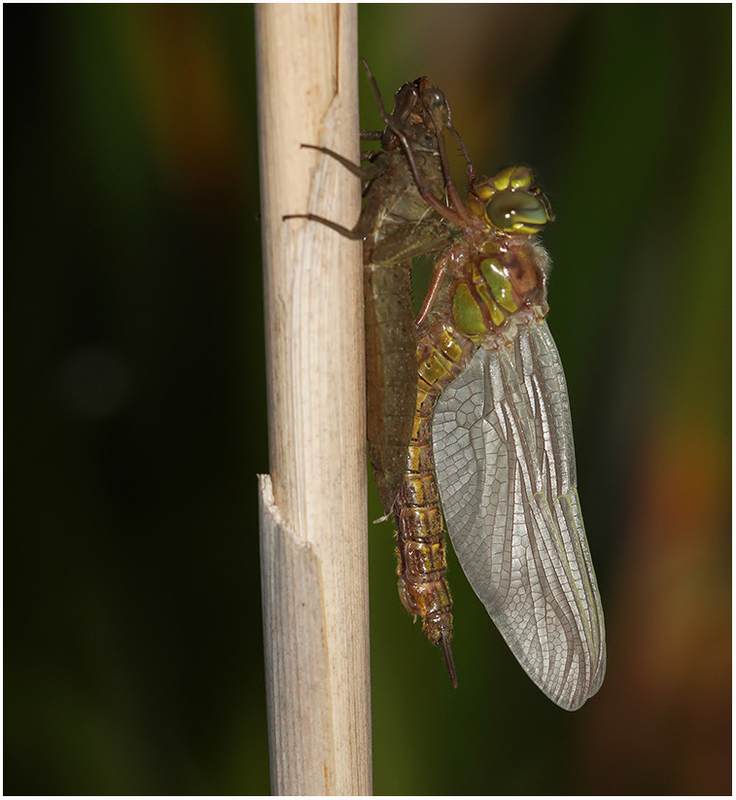 I was up sharpish this morning where when ready, I went back out to the pond where she was still resting up. Having collected this nymph from Nethergong during the winter period, I felt it necessary to return her back to the area where hopefully, she can continue her life successfully. As I have mentioned before, it's truly an amazing spectacle to witness an emergence from start to finish and hopefully, I will be able to capture this scenario again this season with some other species. 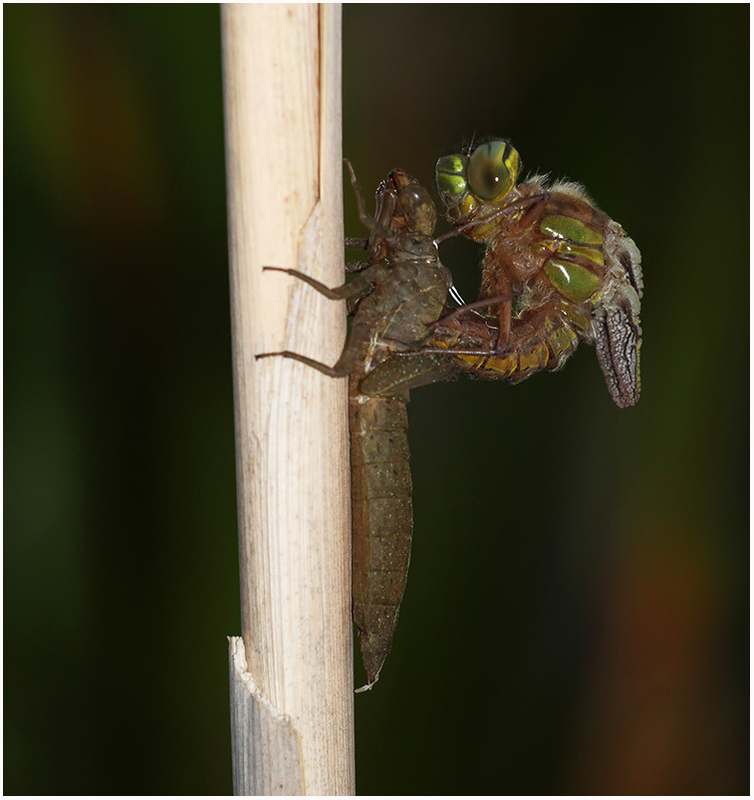 Beautiful Hairy Dragonfly living dream. Thanks Marc. Many thanks Bob. One of nature's amazing sights that are seldom seen by many. Looks like perfect timing Marc. Well done. It took some time for my neighbors to get used to my flashing. Many thanks Mike. I like to think if I keep putting the effort in, then I will get some kind of rewards in the end. Certainly made my day watching and photographing this. 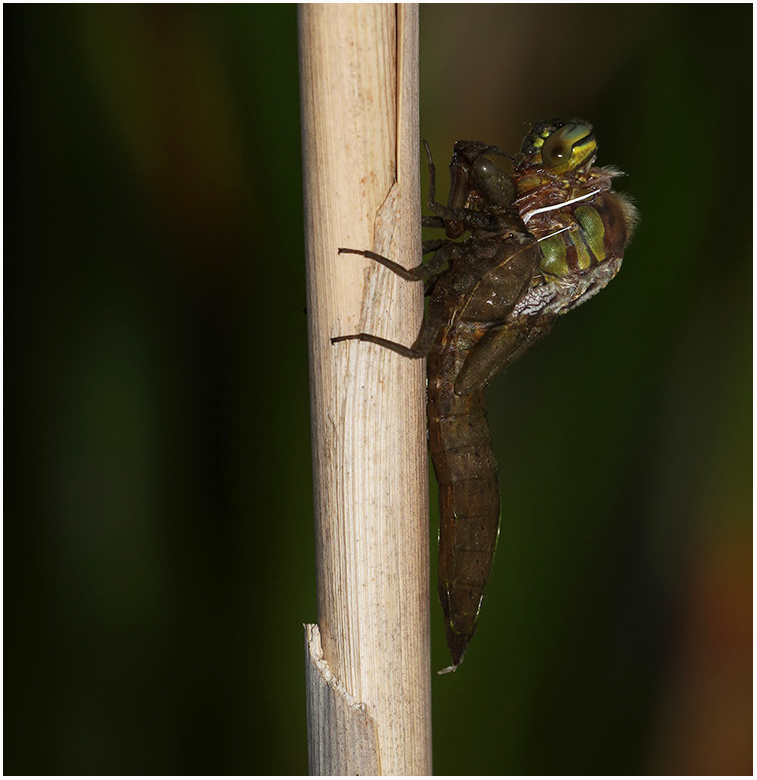 I've only ever seen the full emergence of one dragonfly adult, a Southern Hawker, but it was one of the most wonderful experiences i've had with wildlife Marc. 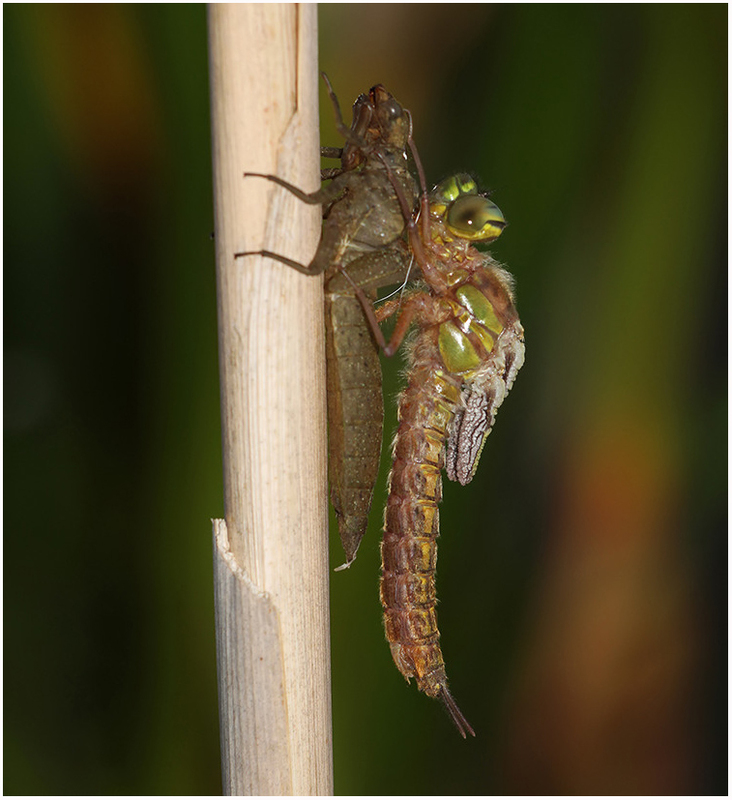 To see the transformation from nymph to dragon is a real wonder in my book and to see the images you've captured over the last few years has been remarkable. It kinda takes me back to that experience I had. Thanks for that. It's also great to see the care you take to make sure these creatures are returned back to where you got them. That shows how much you care about them. That's the best thing of all. Many thanks Johnny for your kind words. They are much appreciated. It's part of the job I feel to return them to where I collected them from so they can continue their lives. 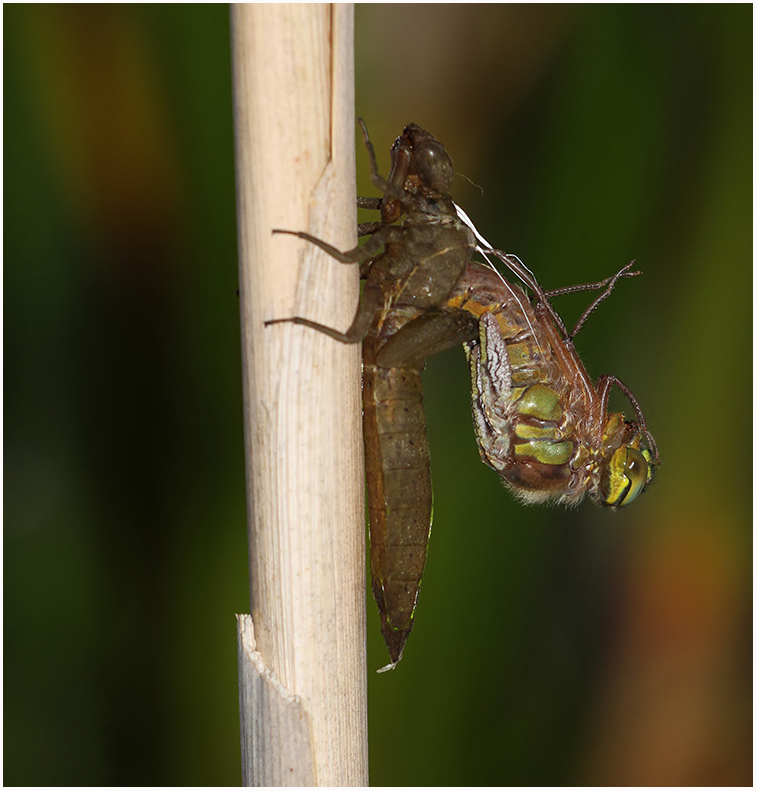 Hopefully some warmer weather next week should see them surviving ok and others no doubt emerging. Many thanks for your visit and comment. Its a sight that many will never see or even know of unless you are purposefully looking. Thank you for sharing your fantastic works. Many thanks Tanza. Using a flash with a diffuser works pretty well. Quite happy with this set although i think ive done much better. Still, the experience is magic. Many thanks Richard. Yes, it was actually pretty cold but once in the moment, all seems to be forgotten. Still amazing to watch and photograph. Don't think I will ever get bored of viewing this secret encounter.